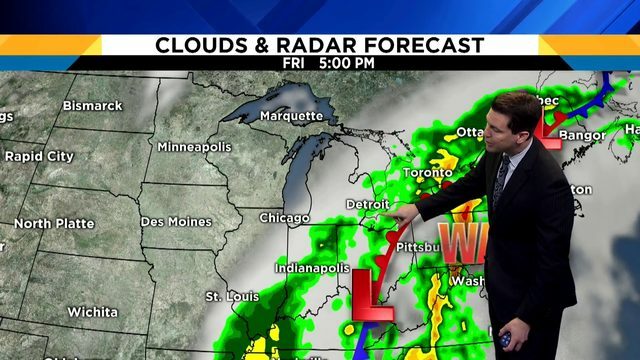 DETROIT - Don’t get used to Friday's temporary temperature rise well into the 50s (13 to 15 degrees Celsius), because our next cold front will arrive tonight. 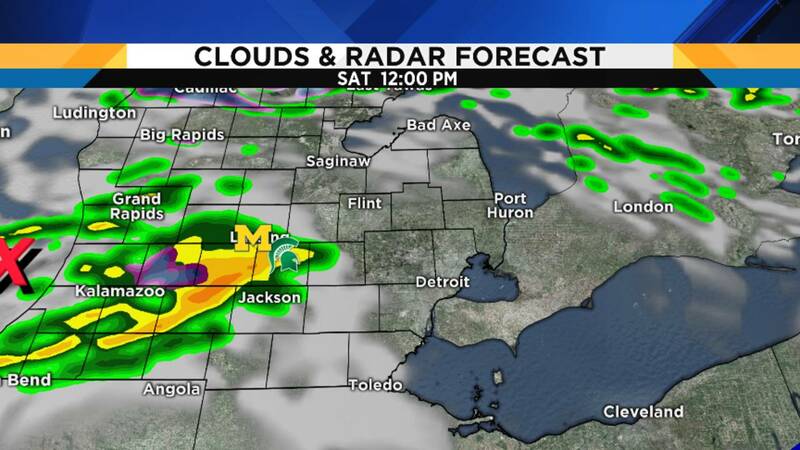 Ahead of the front, expect some rain showers -- prepare for rain if you’ll be at a Friday night high school football game. Temperatures will only fall into the low to mid 40s (6 degrees Celsius) overnight, as we won’t get into the colder air behind the front until just before dawn. 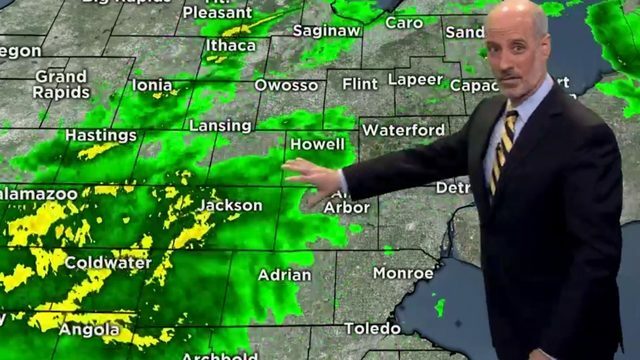 It’ll be breezy ahead of the front, though, as southwest winds will stay up at 15 to 25 mph. 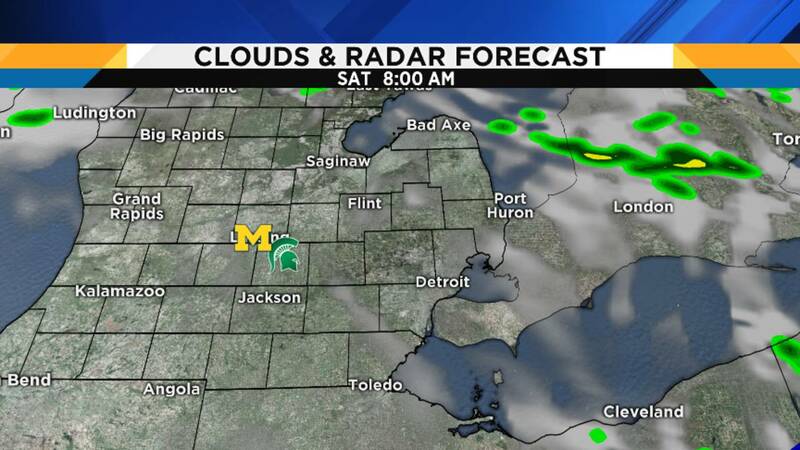 We’ll start our Saturday with some sunshine immediately behind the cold front. Don't be fooled. 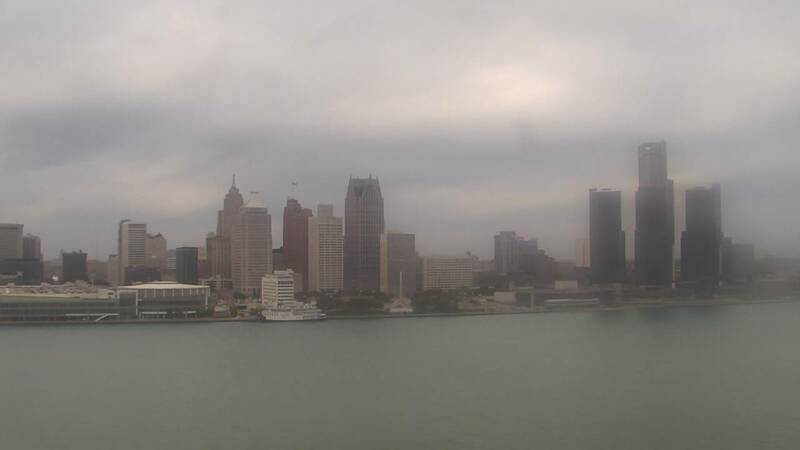 Clouds will increase by midday, and scattered showers, possibly with some snow pellets or wet snowflakes, are likely during the afternoon. Temperatures will initially rise into the low 50s (11 degrees Celsius) by lunchtime, then start falling during the afternoon. Adding insult to injury is that it’ll be another windy day, with west to northwest winds at 15 to 25 mph that will gust even higher than that. 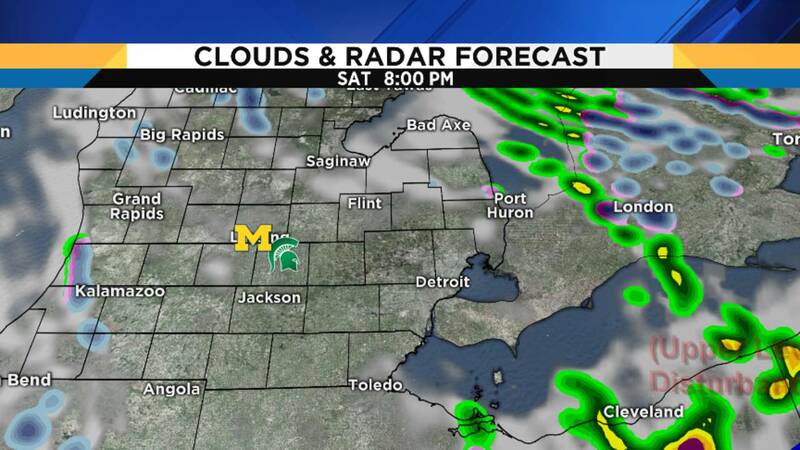 If you are heading to East Lansing for the big Michigan-Michigan State game, we should be dry for the bulk of our morning tailgating and, as I mentioned above, don’t be fooled by morning sunshine, as showers should approach by late morning, and we have the chance for off-and-on showers through the game. 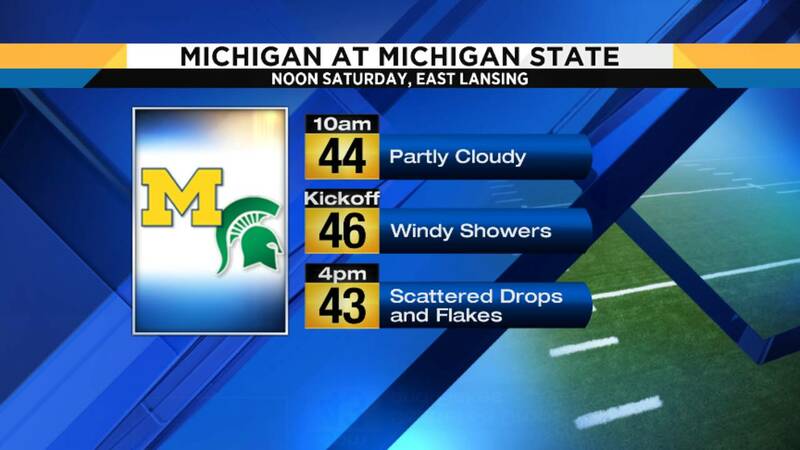 It’ll be a cold (temps generally in the mid 40s/7 degrees Celsius), windy day, and any heavier shower crossing East Lansing could bring some graupel or even big, wet snowflakes. 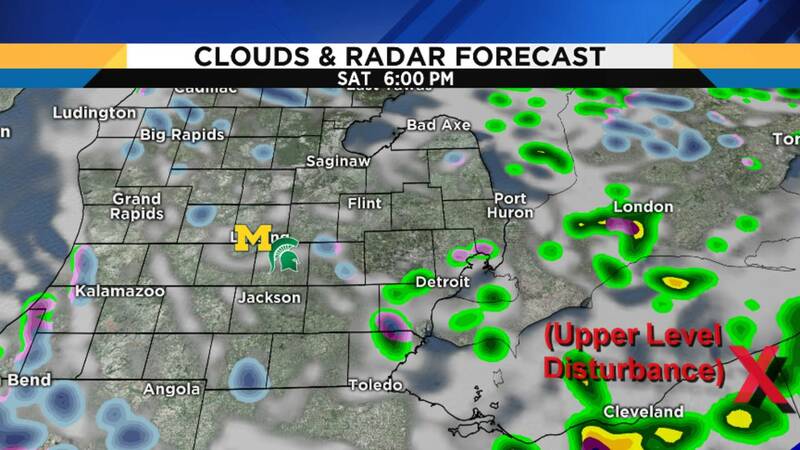 I’ll be at the game in East Lansing, and will be watching the weather closely. 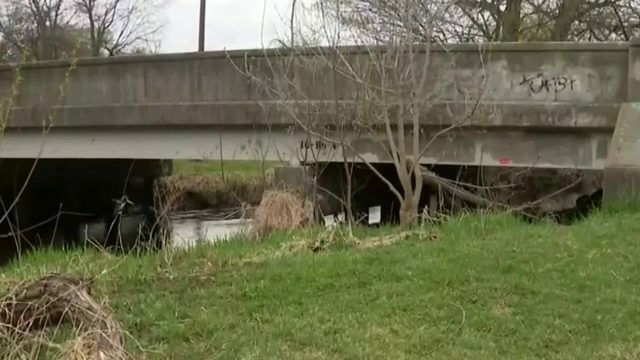 I’ll post updates on Twitter (@PGLocal4) as I’m able to. 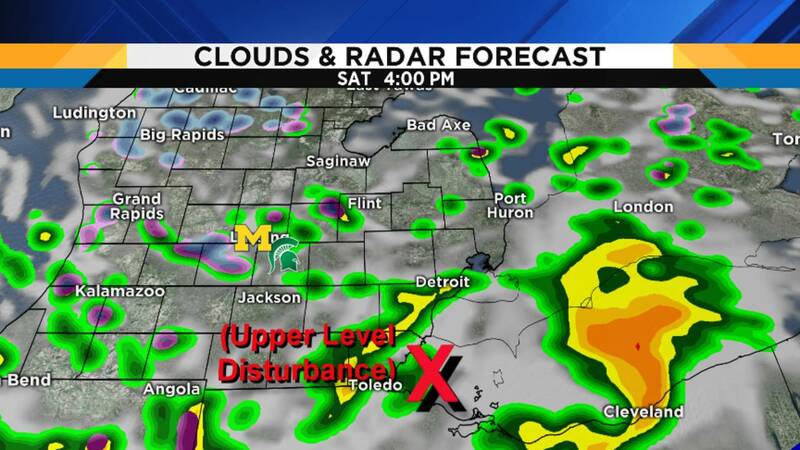 Saturday’s sunrise is at 7:52 a.m., and Saturday’s sunset is at 6:44 p.m.
We’ll see gradual clearing Saturday night, with lows back down near freezing. 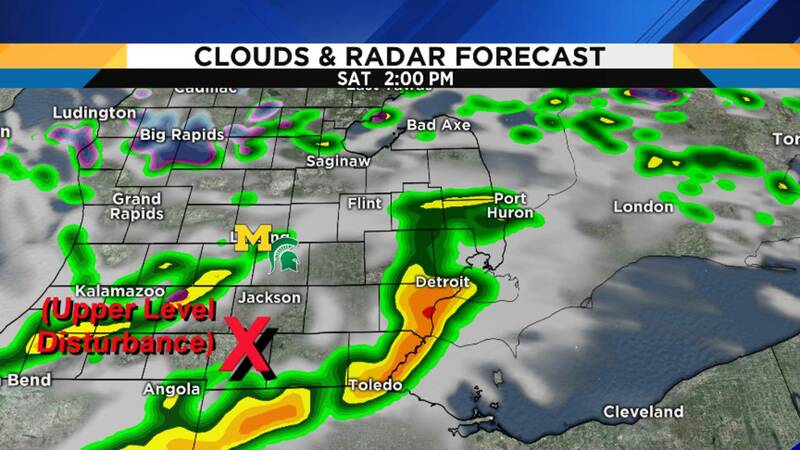 Sunday is the big Detroit Free Press/Chemical Bank Marathon, and nothing has changed from the forecast in yesterday’s article. 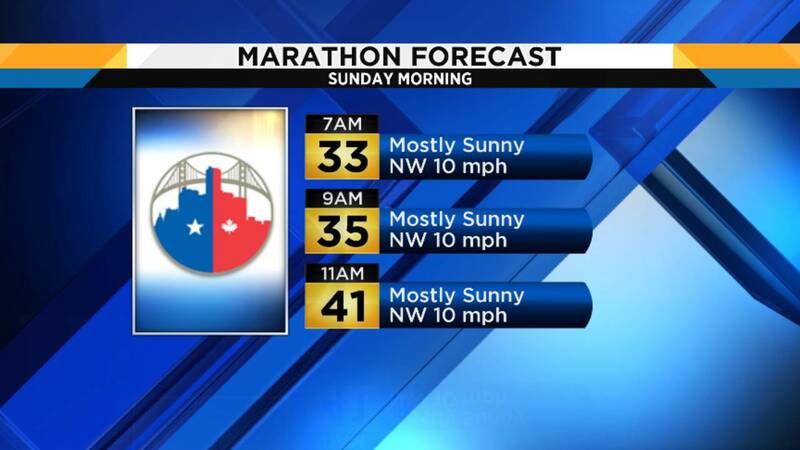 Expect at least partly cloudy skies, with race temps starting near freezing, and rising to near 40 degrees (4 degrees Celsius) by the end of the race. 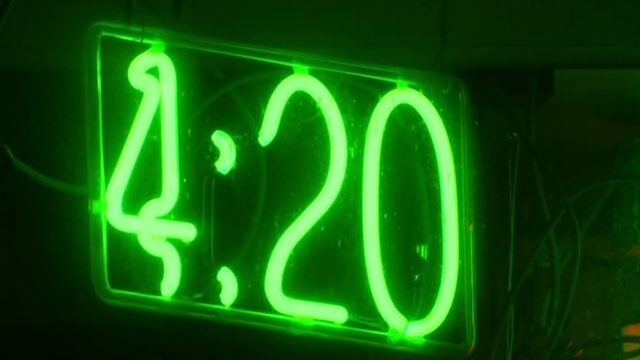 Wind should be from the northwest at around 10 mph. 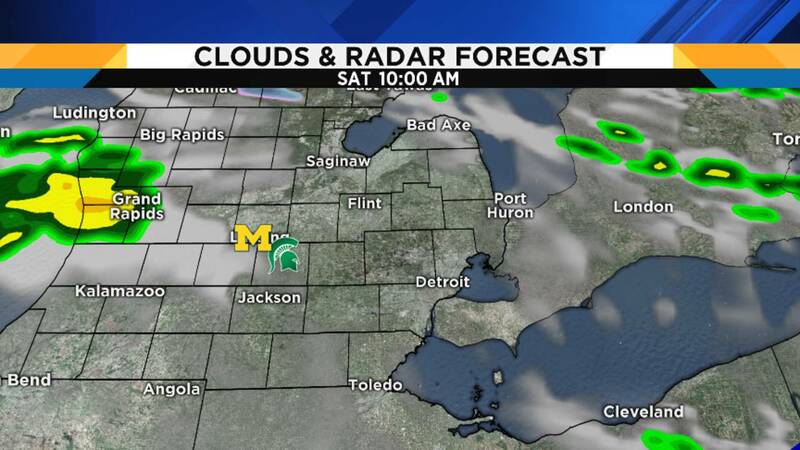 The rest of our Sunday will be partly cloudy, with highs in the upper 40s (9 degrees Celsius). It still appears that the week ahead will feature mostly sunshine, with not a drop of rain in sight. 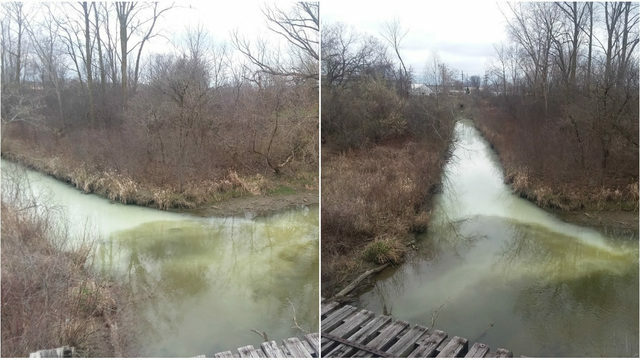 Temperatures will continue well below average with minor day-to-day ups and downs -- generally in the low to mid 50s (10 to 13 degrees Celsius) all week.